Rating: Easy to moderate. Short but somewhat steep, with some rough sections. Drive: Follow Eastman Ave. through the small town of Riondel, and continue along the North Riondel Road 3.2 km to Tam O’Shanter Creek. Here the road changes from pavement to gravel. Set your odometer to zero. You will drive past the turnoff for Chatter Creek Road on your right at .8 km. Look for the sign for Pebble Beach on your left at 2.6 km. There is a parking area for 3-4 cars. Hike: It’s about 1.5 km down to the beach on a well travelled trail. 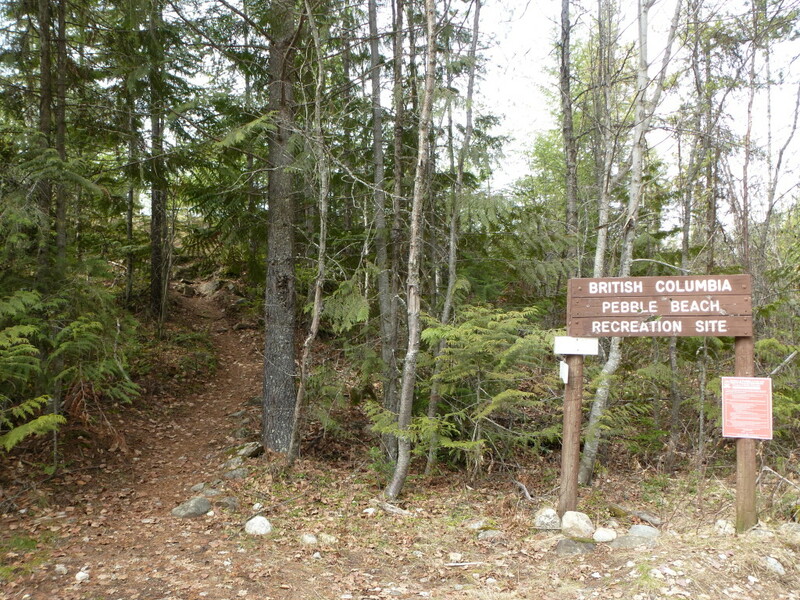 After 2-3 minutes you will cross a right-of-way or skid trail that is much wider than the foot trail, slanting down to the right. Resist the temptation to follow it. Continue on the narrow, boot-beaten track. The trail for the most part descends gradually, traversing back and forth across the hillside, with some nice views on the top section and beautiful big trees lower down. Reach the beach within 30 – 45 minutes. There is a picnic table, an outhouse, and some nice rocky outcrops to explore. Allow an hour to hike back up if you have children tired out with swimming and rock collecting.